Divi Resorts has recently made a philanthropic donation that combines our commitment to protecting the environment with our passion for community service. Together with OneWorld Sustainable, a renewable energy company, we have donated solar panels and equipment to I Too Can Learn, a school for children with learning disabilities on the island of St. Maarten. This donation was given as part of our company-wide Divi Cares program and will help the school substantially reduce its operational expenses. Marco Galaverna, Divi’s President and COO, was introduced to this opportunity by Tim Blackwell, President and CEO of OneWorld Sustainable. Marco and Tim worked together in the summer of 2015, when Divi Resorts purchased a solar electricity system from OneWorld Sustainable for Divi Little Bay Beach Resort. Read more about Little Bay’s new system. 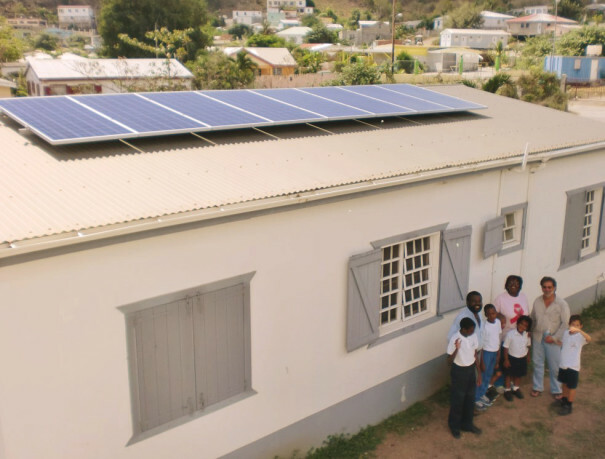 After the installation was completed at the resort, Tim approached Marco with the suggestion that Divi Resorts consider donating solar panels and other equipment to a local St. Maarten school in need, to which Marco whole-heartedly agreed. I Too Can Learn was selected as the recipient because of its inspiring mission and because of the ongoing financial challenges it faces. Since 2013, I Too Can Learn has been catering to the learning needs of children with autism, Down syndrome and other learning disabilities, aiming to break the barriers these students face. The school’s director, Beverley Gibbs, is dedicated to serving her students, but she is open about the difficulties she faces in keeping the school operational due to its very limited funding. For this reason, Beverley was thrilled to accept Divi Resorts’ solar panel donation, which will help reduce the school’s electricity bill each month.